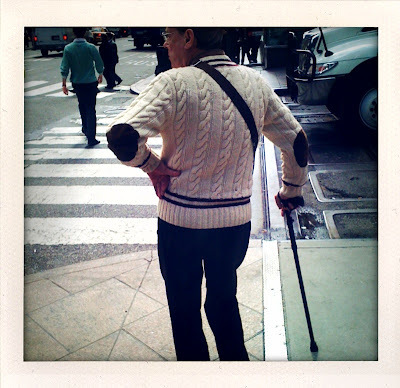 A microscopic burst of street photography on Lexington Ave. after downloading the ShakeIt fake polaroid app on my iPhone. And Porter picked this fair isle dress up at the thrift store in our building for $20. i tried that dress on this past friday. May I ask what the exact name of the App is? Porter does look good in that dress. indelicate question I know but: is she wearing a corset? I love that you use shakeitphoto to take these shots. Great blog! The link that you posted is actually "ShakeIt" when the app you're using here in this post is "ShakeItPhoto". Just to let you know. 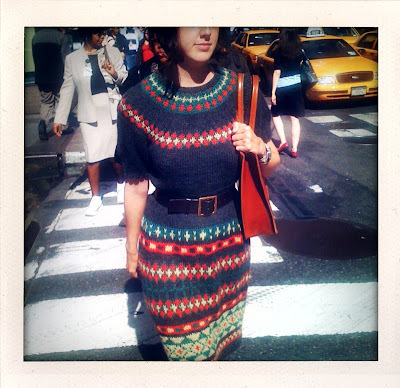 I love Fair Isle sweaters, and this sweater dress is absolutely stunning. I love the colors. It's not traditional, and I think that's why I like it so much.